A gamer’s bag is less a reflection of the gamer and more a reflection of whatever bag he had lying around that fit his books and dice. My game bag history includes cheap backpacks, messenger bags and laptop bags. All were adequate, but all suffered from shortcomings . Cheap backpacks lack decent shoulder straps, frames and hip belts to distribute weight properly. Backpacks also result in “swamp spine” when your sweat builds up between your back and the backpack. Messenger and laptop bags painfully place all the weight on one shoulder, even when you wear them cross-body. All of these lesser bags lack features I want like water bottle storage, laptop sleeves and easily accessible pockets for dice. 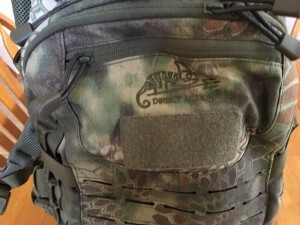 This changed with Direct Action Dragon Egg Tactical Backpack. To keep this review organized, I will work my way down the list above discussing the features of the bag and how it met the criteria on my list. The Direct Action Dragon Egg has two options for water storage. 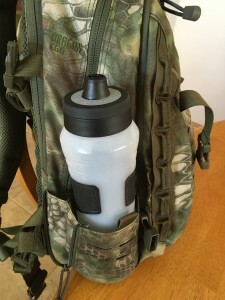 It has an internal pocket for a water bladder (eg Camelbak) and holes/routing for the drinking tube. This is a nice feature for international travel, but less useful at Gencon. For conventions the water bottle storage pockets on either side of the back are my first choice. Note that the pockets have integrated zippers and velcro that stow the pocket tightly against the bag when not in use. The Dragon Egg (hereafter referred to as DA) comes in at a light 3.5 pounds (1590 grams) empty. The entire pack is 500 Denier Cordura nylon with a durable water repellent factory applied. 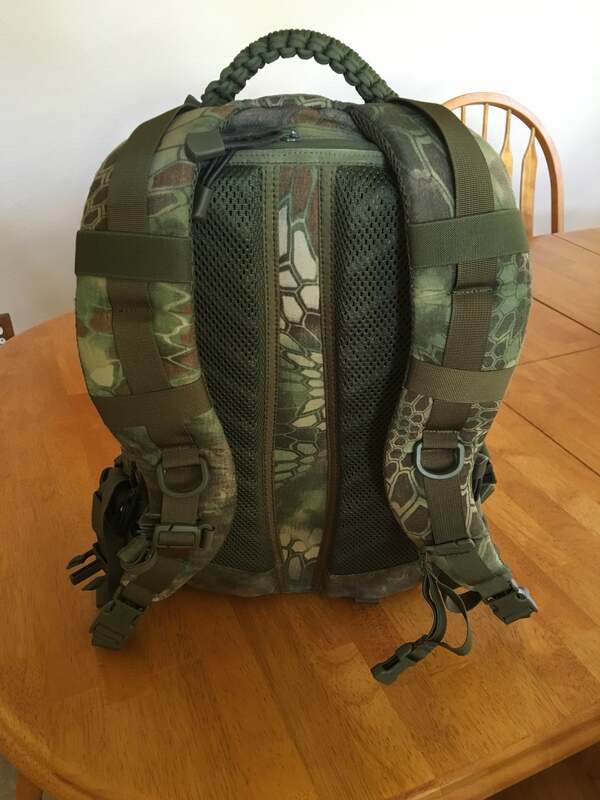 It comes in several colors, but I had to get the one called “Kryptek Mandrake.” I am sure some special forces/hunter types might give you a long dissertation on the relative benefits of camouflage patterns, but I am neither. This pattern reminded me of dragon skin, so it was the easy choice. 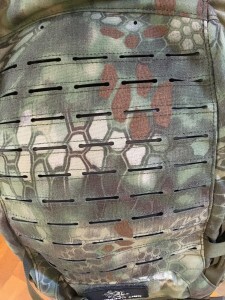 As an aside, the Kryptek company is a relatively new entrant in the camouflage pattern market and it is making waves for its original designs. For my part, their stuff looks cool, so the Kryptek site is worth a look. This was a must for any bag that I bought because my iPad is no longer an optional accessory for gaming. The Direct Action Dragon Egg has an elastic internal pocket that fits my iPad nicely in the outer compartment. Clearly this outer section of the bag is meant for tools and miscellaneous items given the number of small pockets with zippers, pen holders and velcro flaps. Additionally, behind the lumbar support pads is laptop-specific padded sleeve. Here it is pictured with a standard IBM 15 inch laptop. It is a snug fit, but not excessively so. Once the strap is in place the laptop does not move. At the top of the back is also a small zippered pocket lined with soft material for glasses. I am not a fan of this pocket for fragile glasses because there is no crush protection. Still it is an easily accessible pocket for frequently used items (cough…dice….cough). If anything sold me on the Direct Action Dragon Egg, it was the lumbar support system. A stiffened foam panel directly behind the support pads provides the internal frame back “feel” without the metal or the weight. On top of the foam panel are parallel pads of foam with slanted, downward facing channels covered with a breathable mesh. These bracket a “canyon” that varies between 2-3 inches (5-6 cm)wide depending on the location (wider near the lower center of your back) and .5 inches (1.25 cm) deep. There is also a hip belt to keep the back tight against your back. The hip belt is just a belt with no padding, but given this is at most a weekend bag carrying minimal weight I can live with the oversight. This vent system provided airflow during my testing (hiking around with the bag full of stuff) and kept the sweat from pooling against my spine. Overall, it was quite a comfortable experience. The DA has 25 liters of “official” storage. But take note of the multiple little cuts on the back and sides of the pack. These are laser cut MOLLE (Modular Lightweight Load-carrying Equipment) attachment points. MOLLE is the new standard for adding small items and pouches to a pack. Everything from water bottle carriers and magazine holders to map cases and first aid kits is available in MOLLE compatible versions. The attachment points are laser cut, so the edges are not cut nylon, they are fused nylon. Strong stuff and more than capable of handling an extra dice pouch or two. A fuzzy category to be sure, but the DA has the features I think make it a multi-use bag. Plenty of space for iPads, books and dice for the weekend convention while still having the harness, durability and water capacity for international travel. The more I look at it the more things I find. I just noticed that it has space for two Camelbak bladders (though running tubes to both at the same time would be a hassle) and the sharp-eyed among you might think the grab handle breaks down to a few meters of useful paracord. It does, but it will be a true emergency before I cut that handle off. Re-braiding it would be a nightmare. Larger features aside, the fact that every strap has a small velcro tie wrap attached to keep the strap adjustment slack from getting in the way. I usually cut off the excess from a backpack, but this means only I can wear the bag. Little details like this make me happy. Most importantly I noticed there is a place for a “morale patch” on the back of the DA. The Dragon Egg is perfect for my purposes, but it does have a slight drawback. 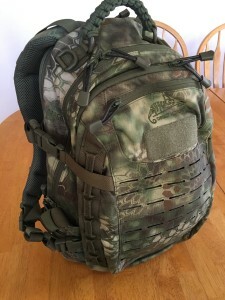 The retail on Amazon for the Direct Action Dragon Egg Tactical Backpack Olive Green is $149.00 and I paid a bit more for the Kryptek camo. Yes, you can get a backpack much cheaper than $149.00. But I love this bag and you can only have it if you pry it from my cold, dead gaming hands.